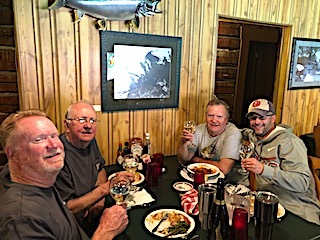 Dan Spartz & and son Adam from Columbus, IN returned for their 5th time with Dan’s brother Jim from Naples, FL, for his first fishing experience at Fireside Lodge dad Jack from Sycamore, IL for his 3rd. 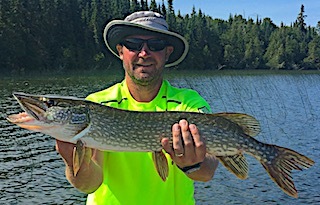 1st day they caught some nice Northern Pike Adam being top dog at 31.5-inches, plus they found a bunch of Smallmouth Bass after supper sizes ranging from 16 to 18-inches all hitting on surface poppers. 2nd day they had a good day catching Smallmouth Bass and after a discussion on fishing certain depths for Northern Pike using a suspending twitch baits with a certain technique, Jim and Adam caught some nice size Northern Pike applying this method, and on the first fish Adam said, Gosh it actually worked. 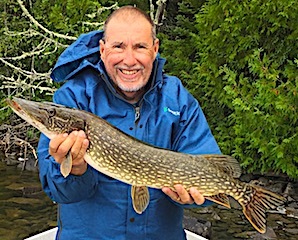 3rd day Adam & Jim teamed up to catch 34 Northern Pike and had a great experience a when walking into a portage lake coming up over a rise finding a Moose standing in the middle of the trail. Both, taken by surprise just looked in amazement at this huge majestic animal while the Moose turned its head and looked right at them. Then the Moose just turned and disappeared in the bush providing Adam & Jim with and experience of a lifetime. 4th day was tough cold front windy conditions with rain on and off all day. Jim and Adam however still caught about a dozen good size Northern Pike sticking with the pause and erratic action technique. 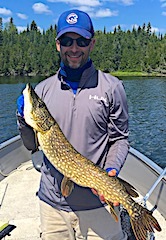 5th day Adam and Dan portaged to Closs Lake getting many BIG follows and Adam hooked two Muskie both getting off, plus he also lost a HUGE Smallmouth Bass and both said they had a great day. 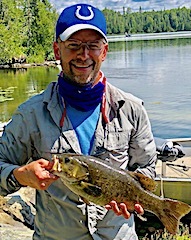 6th and final day was a super finish for this group catching many Smallmouth Bass as Dan said they were just attacking their baits plus Jack came up with a beauty Trophy Smallmouth Bass measuring 18-inches. 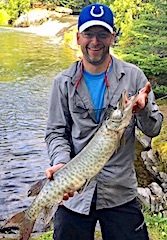 Adam caught 2 Muskie and a trophy 19-inch Smallmouth Bass. On top of this they had a FABULOUS shore lunch by a special location at Twin Falls. 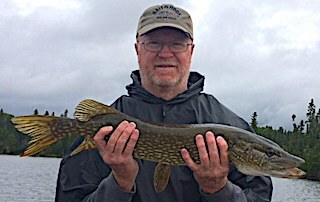 This was a special family fishing trip being able to fish once again with Jack who is a remarkable 85 years young. They all made memories to last a lifetime and are already planning their return trip to Fireside Lodge. Bill & Jill Westbrook from New Philadelphia, OH returned for the 17th consecutive year. 1st night they stared out great each catching an 18 to 18.5-inch Trophy Smallmouth Bass along with about 20 others in the 13-17-inch range. 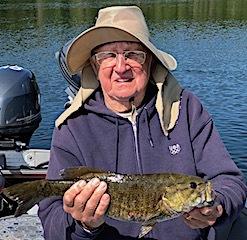 First day they had an excellent morning catching 35+ Smallmouth Bass, Bill landing an 18, 18.5, and 19-inch Trophy Smallmouth Bass. 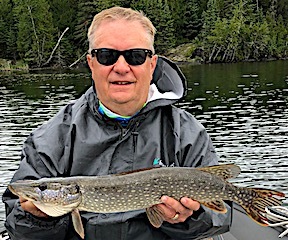 They took it easy in the afternoon Bill mentioning how relaxed he has become taking in the whole fishing experience at Fireside Lodge. 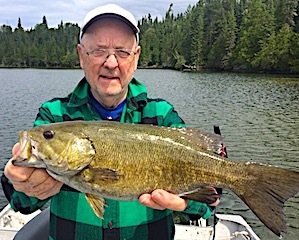 Bill fished alone in the evening catching 10 more nice Smallmouth Bass. 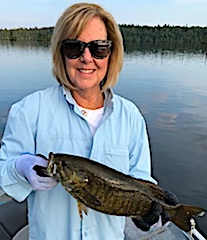 2nd day was their traditional Closs Lake portage day having fun catching 15+ average size Smallmouth Bass, then Bill fished after supper catching 8-10 more Smallmouth Bass including several 16-inches, several 17-17.5 inchers plus another Trophy 18.5-inch Smallmouth. 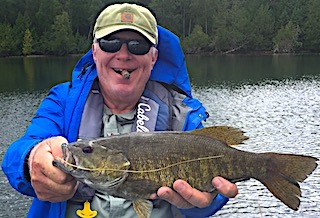 3rd day they caught a few Smallmouth Bass but were in before noon as a cold front with rain and wind came in on them. 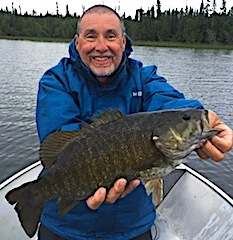 Bill went back out that afternoon / evening and their total by days end was about 25 Smallmouth Bass with two Trophy fish right at 18-inches. 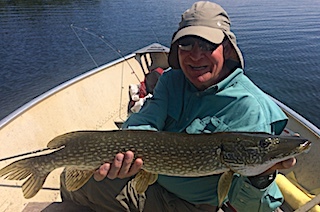 4th day was post cold front conditions catching about 15 fish with several being 16-17.5-inches. 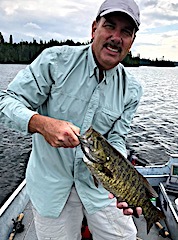 Bill after supper picked up another 10+ Smalllmouth Bass, all on the larger side, one being 18-inches. 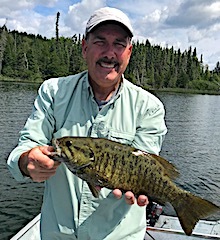 5th and final day was a beautiful day weather wise and the fishing was also great catching a lot of Smallmouth Bass to end their trip on a high note, making their 2019 reservations before departing. 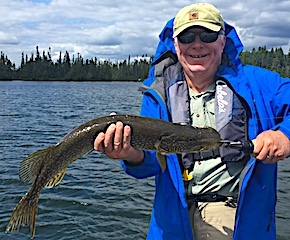 Mike Stevens, with Son Brad from Lake Barrington & Barrington, IL, Paul Lampier, Phil Seroczynski, & Paul Douglas from Elgin, Palatine, & Hoffman Estates, IL and Bob Lauffer Clermont, FL with Johnny Sills from Orlando FL were back to visit us for their 5th time, and for Brad it was his first experience fishing at Fireside Lodge. 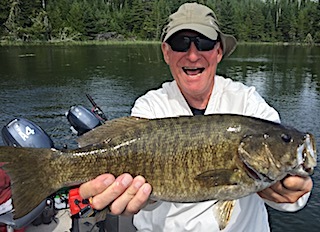 DOA in just 2.5 hours they all caught fish before supper with Bob & Johnny landing 13 nice Smallmouth Bass. 1st full day was full of adventure when trying to navigate a creek to get to Muskie Lake finding the beavers hard at work restricting their ability to get past it they retreated. 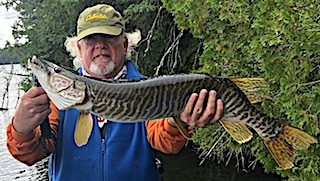 All had a good day catching a variety of Smallmouth Bass and Northern Pike and Phil landed the first Muskie in the group. 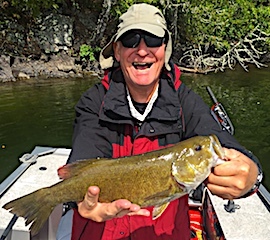 2nd day highlights, Mike caught a bakers dozen Smallmouth Bass while fishing alone, Bob landed a HUGE 19-inch Trophy Smallmouth Bass fishing a surface Popper saying that the fish crushed it and leaped about 3 feet out of the water, making his catch all that more exciting. 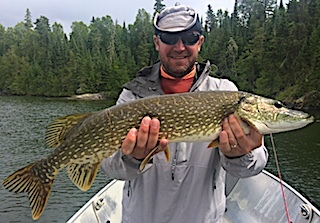 3rd day Mike and Brad had a special day catching many Smallmouth Bass with a lot 16 to 17.5-inches and Mike got a BIG 18.5-inch Trophy Smallmouth, while the others also had a good day fishing catching a variety of Northern Pike, Smallmouth Bass, and Johnny caught a nice 35-inch Muskie. 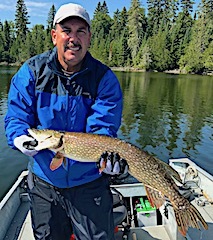 4th and final day (Boy 4 days Go Quick) Mike & Bob chased Muskie for the first half day getting many BIG follows & Mike landed one plus caught some nice Smallmouth with Bob catching a Trophy at 18-inches. 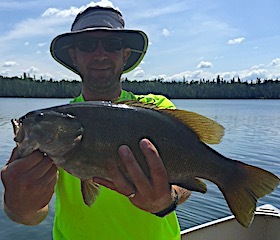 Johnny and Brad had the same idea fishing for Muskie also getting follows but no takers, caught some Northern Pike & Smallmouth and Brad caught his 1st ever Master Anglers Award Trophy Smallmouth Bass measuring 18.5-inches. All left having a Great them among good friends and hope to return in the near future.